On Thursday, the leaders of the US, China, Britain, France, Italy, India and over fifty other countries will gather for a biennial Nuclear Security Summit in Washington. The summit will be dedicated to making largely meaningless declarations of unity and international collaboration in the face of a recent wave of terrorist attacks in Europe. Behind the scenes, briefing papers published by intelligence agencies and think tanks, whose reports are rarely if ever mentioned in the national press or on the evening news, tell a different story, one hinted at by the decision of Russia not to send representatives to the summit. The private intelligence think tank Stratfor declares that the world is in the midst of a “new arms race,” with major global powers, led by the United States, working aggressively to modernize, upgrade and expand both their conventional and nuclear arms. In 2010, US President Barack Obama vowed that the US would “not develop new nuclear warheads or pursue new military missions or new capabilities.” Like most of his other promises, this pledge was broken. 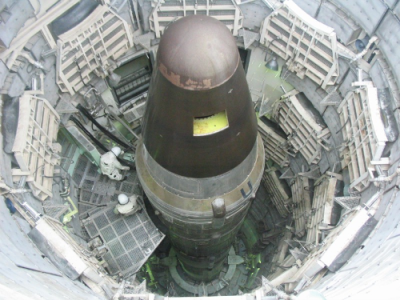 The White House has initiated a $1 trillion program to modernize the US nuclear stockpile. The program will upgrade existing nuclear warheads by wedding them to precision-guided missiles, and will provide mechanisms to adjust their yield so as to make them easier to use on the battlefield in tandem with conventional weapons. In January, the Defense Department announced it was moving forward with plans to replace its Ohio-class ballistic missile submarines with a completely new design beginning in 2021. Each one of the US Navy’s 14 Ohio-class ballistic submarines constitute the fifth most powerful military force in the world. Every submarine carries 24 Trident II missiles. Each missile carries eight warheads with a yield up to 36 times greater than the “Little Boy” bomb that killed tens of thousands in Hiroshima in 1945. Yet the Navy views this as inadequate. Each new submarine, of which there will be 12, will cost $6 billion to $8 billion, up from $2 billion for the Ohio class. This estimate excludes research and development, the price of each submarine’s nearly 200 nuclear warheads, and associated operating costs. Each of these submarines is estimated to cost 5–10 times more than the construction of a major teaching hospital, which would provide care for thousands of people. The dramatic development of the US nuclear arsenal is part of a radical modernization of its armed forces, including the expansion of the F-35 fighter program, the estimated cost of which has ballooned, according to the latest figures, to $1.12 trillion. The US Air Force has complained that that it does not possess a next-generation stealth aircraft capable of delivering high-yield nuclear weapons. The result is the announcement of the procurement of the latest US bomber, the Northrop Grumman B-21, of which the Air Force plans to purchase 100 at half a billion dollars apiece. Along with shifts in the geopolitical situation and changes in technological capabilities, the US military and its accompanying think tanks are changing their doctrines and terminology. It is a well-known fact that the outbreak of the First World War was preceded by a race between Germany, Britain and other imperialist powers to build the latest and largest battleships, known as dreadnoughts, together with the expansion of their traditional military forces. Between 1908 and 1913, military spending by the European powers increased by 50 percent. No one should believe that today’s arms race will have different consequences. These weapons, soaking up a substantial share of the world’s wealth, are meant to be used. For the first time, a world war is on the horizon between combatants possessing nuclear weapons, under conditions where the rules of engagement are being revised to make their use more likely. Mankind finds itself in a perilous situation. Imperialism is leading society to a catastrophe that can be averted only through revolutionary means.